As the title states, Everyone's in Sales. You say, “wait, Ryan, I’m not in sales." Is this not what some of you are thinking? For example, you might be picturing salespersons as those who “over promote” their products and services or themselves at the cocktail party. You may imagine salespersons as those who join online groups and “pitch/hard-sell” you their offerings or come "door to door" in your neighborhood. So, although this may not be you—(and I hope it is not) I promise… you are still in sales. Everyone Is in Sales because it is not about sales. Instead it is ALL about communications. We are all “attempting” to communicate our message to others. Some people do it better than others. So, let me let you in on my secret. I am purposefully “reframing” the world sales to be that of communications. So how about this? In the world we live in everyone is in communications. Most people feel more comfortable with that. It is the same idea. Don’t you agree? Please give me the “virtual head nod.” Oops… I was selling. J This blog post is simply a good way to get us thinking about this subject, overview the book, and connect with you. Remember being good in “sales/communications” means you are not focused on sharing how great your company or kid is but focused on listening to and engaging with others. It is about new ways in which you can bring solutions to your clients or helping your friends. It's not about how much time you are online but very much about making each online encounter a valuable, unique and meaningful experience. It is about a conversation and a dialogue. We all do these things and want these things- right? So, from the Ball Field the Boardroom, we are all in sales. 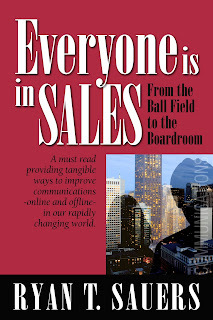 My book, Everyone Is In Sales due out later this year. So, this post gives you a sneak peak at a part of the book. By the way, we are offering pre-order book purchase incentives. See—people are always selling. 🙂 The preorder price of $14.95 includes a special signed copy with a message and shipping to you. So click the button below and order today!